If you care about your records, you should always damp-clean each side just before playing. LPs are natural dust collectors. They seem to develop a static charge spontaneously, and will attract any loose detritus from the platter surface, the inside of the record sleeve, and even the surrounding air within a 6" radius. Damp-cleaning is performed while the disc is rotating, with a small pad of plush or velvet which has first been saturated with tap water and then wrung in a towel until damp. Start at the run-out grooves, and wipe slowly outward and off the edge. I have never found a dry disc cleaner that works, and my advice is to ignore them. All they do is push the dust around a bit and redeposit it in the bottoms of the grooves. The disc will look better—but only until you inspect the groove bottoms with a magnifier." That's the technique I use... I don't use tap water, I use distilled water and an original discwasher brush... thats all you need if you keep your records clean. 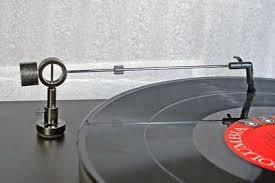 Back in the day, Watts of England made a nifty device called the Watts Dust Bug, which was a plush roller at the end of a thin plexiglas arm that fastened to the turntable deck with a suction cup. You put a few drops of the Watts fluid on the Bug and set it on the record before you set the stylus down. The Bug tracked just like a stylus and swept the grooves clean ahead of the real stylus. An occasional cleaning and drying was all it took to maintain it. Watts sold another device called the Humid Mop which I think was used to clean the Bug. I just washed the Bug a few times a year with Dawn and rinsed and dried it thoroughly. Any dust from a cleaning cycle could be flicked off after the Bug fluid had dried. Alas, the Dust Bug seems to have passed away with the CD age. It is so simple and effective that I wish it could be revived. I also used one of the original Discwasher brushes and I never thought it did as well as the Dust Bug. Besides, the Dust Bug intercepted dust that arrived during the playing cycle, which an off-board brush can't do. Do have a royal blue lined in gold Bill Blass dress smoking jacket that is non-velvet but has similar, I will say, qualities. At the moment it is at the cleaners. Could well spare a few inches off of the wrap in case you become hard pressed. Vague recollection has it that, the deep red, close to wine colored material used in gent's and ladies lint brush with brown handle ( you know the type ) that you stroke the garment in one direction and in the other to remove lint, may well be pressed into servicing this task. Have used a spray called Pfan-Stat made for records with varying results I keep handy. Like the idea of distilled water as well so, may well try it instead, as the spray may be confounding the condition longer term. I like this kit better than the Discwasher. Seems to do a much better job. The pad picks up dust better. 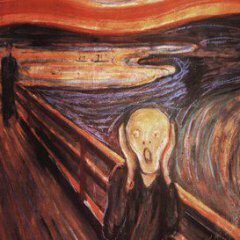 So you have done double blind ABX testing? However, I did notice the pads sounded exactly alike while cleaning..
Looks like there are a few NOS Bugs on the bay. Pricey though, so I may take BillyBob up on some of his smoking jacket. Actually I could probably find some velvet at a fabric shop, and glue it to a cut down part of a wooden dowel. I would presume real velvet, not the poly kind would be best for the records. Never realized you could wet dust. I'm enthused about this. Just let know, as it is only the wrap or belt. In any case still have the mailing packet sent from my trivia winnings so, not a problem. BTW, using winning sparingly as, a collector's item. 60th anni. Does anybody got a velvet smoking jacket they could cut up for me to use? Welllllll I dunno... Anyone ever tried shakin a bit of distilled water and LITTLE BIT of Dawn up? I've refilled my bottles for years then just dampen the Discwasher pad and go after it! Good enough for wildlife and oil slime it's good enough for me. Now where did I leave my jacket? This plus a Diskwasher and closing the vibration damped (not dampened!) lid for the turntable is pretty foolproof. Of course, some had brushes similar to the one on the right, and a reservoir of distilled water (distilled without any copper in the still -- certified all glass condensers used!) nearby that fed though a tube and dropped water through a sealed funnel (like an IV drip) into the waiting opening in the tracking brush near the fulcrum). The records were actually wet with a thin film of water. I always wondered whether stylus cantilevers corroded. Then there were vacuum brushes, and various radioactive devices (the alpha won't penetrate the skin -- how about the cornea? ), and for the Flash Gordon in one, the Zero-stat gun. I visited CBS Records in San Francisco (Columbia) and went in to see the Scully Lathe cutting away in a cloud of cigarette ash. Clicks and pops? Then there were those who used alcohol (on the records), possible damaging the vinyl, but when some record cleaners (conceivably with carbon tet) had a picture like the one shown below on the bottle, it was best to look elsewhere. To my opinion applying water on the record surface with a velvet is just asking for collecting debris and pushing it into record groves. Don't know either. Cannot see doing any irrepairable harm given cleaning methods. A take away for me is a light surface erase of not so much accumulated but a very light surface erase of dust that may accumulate. With only a very light dampish material. See what you may be saying though? 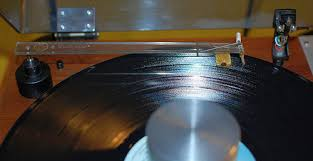 At least the original Discwasher back in the day had directional fibers that scooped into the grooves. Looks like RCA is marketing them now, but I think RCA ain't RCA anymore, either, so who can say... Many good old names (not restricted to audio) were sold to marketers who do business out of China.